#1 Only fiction writers can explain why someone else acted as he or she did, or what that person thinks, and only then when writing in the third person. Darla’s granny is long gone, so there is no way Darla can tell us why she acted as she did. Even if Granny were available, Darla could only report what Granny told her, what she observed Granny doing, or her own speculation about why Granny did what she did. #2 This is Darla’s story. It’s about her experiences, thoughts and reactions. It doesn’t matter why Granny did anything. The fact that Granny did do something is what affected Darla. Granny’s deeds and Darla’s reaction and understanding are key story elements, not the reasons why Granny acted as she did. If Darla wants to do research on her grandmother’s history and speculate on why things were as they were, that speculation may be relevant, but to maintain credibility, she’ll be well-advised to use phrases like probably, it seems like, or might have as she spins her tale. Granny didn’t even bother to wrap the battered old suitcase she used to hold the collection of used kitchen items she gave me as a wedding present. For a few months I resented the fact that she gave me cruddy old cast iron skillets and dishes she’d used for years. She could have afforded to buy me new things. I felt like she was telling me I wasn’t good enough for new things. Then I realized that she had given me things she had used. All of it was useful, and it reminded me of her more powerfully than anything new would have. It gave me a sense of connection with her, of continuity between generations. Maybe she was being stingy – that wouldn’t be surprising considering the austere circumstances of most of her life – but it doesn’t matter. I came to love her old gifts, and I’ve already promised to pass those by-now-antique cast iron skillets on to my granddaughter when she marries. By showing what Granny did (gave me used gifts), and how my attitude toward them changed, I’ve given you a view of Granny and also my own thought. Would you believe me if I tried to explain why Granny did what she did? Does that matter? As you write stories involving other people, especially people who aren’t available to explain their versions of things, be sure you stick to your own story and your understanding of what they did. You can only speak for yourself. Write now: do some writing practice using a person you make excuses for, at least to yourself as your prompt. In your writing tell what happened to the person to cause what you consider to be inappropriate or disappointing behavior, how you feel about it, and how you handle and explain it. Use examples of behavior. If you feel inspired, turn this account into a story. Sharon, I love this post. You have illustrated key points about telling our stories from our POV (really the only one we can speak from with any credibility) and you have clearly shown how weaving in details from your POV reveals your grandmother's character as well as your response to her. Thanks for this great lesson! Great post! 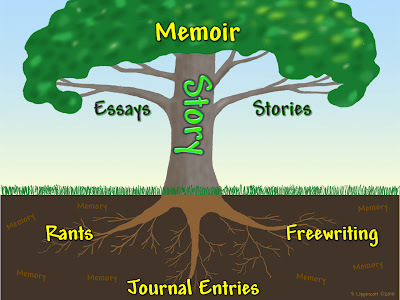 As a life writer I appreciate the reminder to stay with telling my story. Some great advice I got once when I was worrying about if I had another person "right" in my writing was "If anyone disagrees or says it didn't happen exactly that way, let 'em write their own story!" That took off some of the pressure and freed me to write my story. Kathleen and Judy, I'm glad I was able to get this point across in a meaningful way. Kathy, Perhaps I should have mentioned that the iron skillet event gave me the chance to show how my attitude shifted and evolved. But I think you picked up on that. Judy, whoever gave you that advice sounds wise to me. It's not always easy to relax into our own story, and the concept of focusing on our reactions to the behavior of others is not widely discussed. Let's change that! Sharon, wonderful post, as always! We want to understand others' behaviors, but the truth is we can only truly hope to understand our own responses and to grow through that understanding. Thank you for reminding us that we need to remain true to our own story in order to remain true to nonfiction. When writing about someone else, especially if we have that "over-thinking syndrome" like I do, we may run the risk of making connections that just aren't there. So, yes we do have to be very careful. While talking to my father about his WWII days, it made me consider and wonder if some of the things that happened to him affected how I was raised. But as you said, you can only write truthfully about your own experience. I had to laugh at your used gifts. My grandmother gave used gifts to her grandchildren on a regular basis. The most memorable was when we got (several years in a row) playing cards with a hole punched through them from Vegas! I wish I'd kept a deck! Very interesting. It's easy to get caught up with trying to understand other people and why they do things. But you make a good point that that is not what is actually important. I really appreciate what you have to say and I will try to take this approach in my journaling! I want to focus more on my reactions and my feelings and why I am doing the things I do. Thank you. I'm please you both found benefit in these thoughts. They took me more than half a lifetime to "get." My hope is that they'll spur others to do the introspection sooner than I did.